Here’s a loving way to say “merry Christmas” to wonderful grandparents, and this ornament is often given by grandparents to the grandkids. Either way, the recipients will be delighted with the cheerful seasonal colors and the adorable cubs in their holiday caps emblazoned with their names. 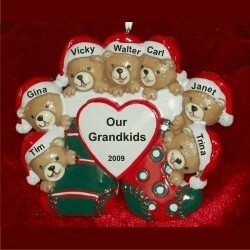 The 7 grandkids personalized Christmas ornament includes an attractive cord for easy hanging. We’ll hand letter the names on the seven grandkids Christmas ornament personalized to make it a lasting keepsake, one of our grandparents ornaments that arrives in our exclusive velvet gift bag.